At Fraum Chiropractic Life Center, we offer our patients a variety of integrative solutions to speed recovery and maximize function, with an emphasis on drug-free and nonsurgical options. While growing up, Dr. McGinnis was frequently hospitalized while suffering from severe asthma and allergies. Chiropractic care was the only treatment that gave him a glimmer of hope that he could recover. Once he started with consistent treatment, that hope became a reality. He also used chiropractic to help him heal from numerous sports injuries, which led to his future specialty of sports chiropractic. Dr. McGinnis received his Bachelor of Science Exercise Physiology from Virginia Tech. He went on to earn his Doctor of Chiropractic degree from Sherman College of Chiropractic in Spartanburg, South Carolina. His enthusiasm for his profession drives him to remain relevant and up to date in current treatment styles. He wants his patients to have access to all advanced natural healing methods — ones that suit their needs. Dr. McGinnis has taken extensive coursework in postgraduate studies, and now specializes in sports injuries and exercise rehabilitation. 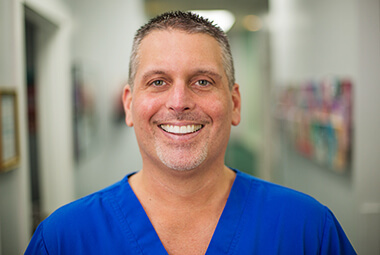 He is also a Diplomate of the National Board of Chiropractic Examiners and has been honored by Hilton Head Monthly as the Readers’ Choice Chiropractor of the Year from 2008 to 2016. Dr. McGinnis has extensive training in the treatment of sports injuries and exercise rehabilitation. When Dr. McGinnis isn’t busy improving the lives of those he serves, he loves to spend time with his wife and participate in outdoor activities such as boating, fishing and spending time on the beach. He’s also actively involved in the South Carolina Chiropractic Association and the Hilton Head Island-Bluffton Chamber of Commerce. Our office is accommodating, and we’d love to welcome you as a new patient. We feature a multidisciplinary approach in our natural healing center to meet your every need. Reach out to Fraum Chiropractic Life Center; we can help!